These wood vent covers can be made according to any size or design you'd like! Our decorative wall vents are an open return air grille which will allow the air to constantly flow through your home. The wood vent cover is 1/4" thick and is made out of Baltic birch hardwood ply. On top of the decorative wall vents faceplate, you can choose between cherry, oak or a maple furniture grade veneer. We leave the wood vent cover unfinished so that you may stain or paint your grilles in whatever color you'd like. The maple veneer is recommended for painting. A larger image of available designs can be found HERE. These decorative wall vents are laser cut for precision and cleanliness so you are sure to receive a finely crafted item. 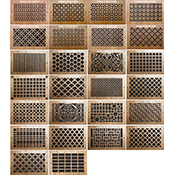 Our wood vent covers are a great choice to make when looking for an alternative to traditional metal grilles. The decorative wall vents can be purchased with pre drilled screw holes or with none if you'd prefer to make the holes yourself. Screws always come included. To install your wood vent cover onto the wall or ceiling, simply screw mount them into place. These are not intended for floor use. Tip: When purchasing the wood vent cover, order according to your wall hole opening. The decorative wall vents border will be made 1 3/4" larger than the size listed. Important: These wood vent covers are not to be used on the floor. Because the decorative wall vents are custom made, they are considered a non returnable item and cannot be canceled once order has been placed. 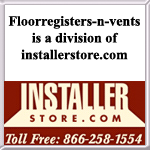 Allow your wood vent covers 7 to 15 business days to be made and then to be shipped. In need of decorative wall vents with a damper to open and close your airflow? Selected Pattern Cut register sizes are available which include a damper unit with the grille. Order your wood vent cover now to match literally any style or pattern in your home for an affordable cost. Design Design "A" Design "B" Design "C" Design "D" Design "E" Design "F" Design "G" Design "H" Design "I" Design "J" Design "K" Design "L" Design "M" Design "N" Design "O" Design "P" Design "Q" Design "R" Design "S" Design "T" Design "U" Design "V" Design "W" Design "X" Design "Y" Design "Z"
Choose Hole Size 6" x 4" 6" x 6" 8" x 4" 8" x 6" 8" x 8" 10" x 4" 10" x 6" 10" x 8" 10" x 10" 12" x 4" 12" x 6" 12" x 8" 12" x 10" 12" x 12" 14" x 4" 14" x 6" 14" x 8" 14" x 10" 14" x 12" 14" x 14" 16" x 4" 16" x 6" 16" x 8" 16" x 10" 16" x 12" 16" x 16" 18" x 6" 18" x 8" 18" x 10" 18" x 12" 18" x 14" 18" x 16" 18" x 18" 20" x 6" 20" x 8" 20" x 10" 20" x 12" 20" x 14" 20" x 16" 20" x 18" 20" x 20" 24" x 6" 24" x 8" 24" x 10" 24" x 12" 24" x 20" 24" x 24" 30" x 6" 30" x 8" 30" x 10" 30" x 12" 30" x 14" 30" x 20" 30" x 30"